Avail the Hydraulic Dock Leveller from us that are manufactured as per the set standards by utilizing best available resources. The Hydraulic Dock Leveller, we offer, efficiently bridges the gap between the trucks and docks, thereby reducing the loading and unloading time. Hydraulic Dock Levellers, we provide, mean profit on the shop floor by bringing height differentials between trucks and docks the easy way, thereby reducing loading and unloading time and decreasing the likelihood of damage and accidents, because interruption means loss of time and money. We put the emphasis on quality; long warranty on essential parts is concrete proof of this. All these advantages results in a trouble free use for years on end in recovering the costs in a relatively short period of time. Dock Leveler is an adjustable ramp used between the transport vehicle and dispatch area of the warehouse or factory for efficient material transfer applications. Bridges the gap between the dispatch area and the transport vehicle and compensates for variations in the truck bed height. When the DOCK LEVELER is in operation, it is fixed to the building and rests on the bed of the truck. 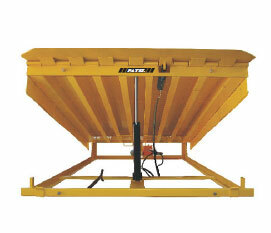 Depending on the type, the Dock Leveler is placed on its position manually or power operated.